After 20 days of suspense, President Rouhani submitted his $47 billion budget for the next year on Tuesday, December 25, reflecting not only the seriousness of the country’s economic crisis but also the extent to which the Supreme Leader has become involved in the country’s economic matters. The budget, which the president presented to the parliament, covers the Iranian calendar year 1398 (March 21, 2019-March 19, 2020). It stands out from other budgets presented in recent years chiefly because it pays so much attention to the damage done to the Iranian economy since the resumption of US sanctions, but also because it is the product of unprecedented interference by the Supreme Leader Ayatollah Khamenei — who reduced the initial proposed budget by 26 trillion tomans, or more than six billion dollars. So what role has the Supreme Leader had in the forthcoming budget, and what does the Iranian public and media have to say about it? Under Iranian law, Thursday, December 6 was the last day for President Rouhani’s government to submit the budget, and Mohammad Bagher Nobakht, the head of the Plan and Budget Organization, confirmed that the 14-part budget bill had been sent to the parliament [Persian link]. Then came the announcement that President Rouhani would attend a parliament session on December 16 to defend the budget and answer questions about it. But that is not what happened. On December 11, there were reports that Ayatollah Khamenei had requested changes to the budget. The source was no other than President Rouhani himself. In an emergency meeting between the heads of the three branches of the government on the same day, he said they had received “a directive from the Supreme Leader” and, therefore, changes to the budget “might be necessary” [Persian link]. Over the last 15 days, “the Supreme Leader’s directive” has become a catchphrase in Iran’s news reports about the economy, although it took a few days for it to become clear what in the budget was bothering Ayatollah Khamenei so much that he found it necessary to interfere so publicly. What Didn’t the Supreme Leader Like? There were various speculations as to why Ayatollah Khamenei had decided to interfere with the budget, but it took another six days for Ali Larijani, the Speaker of the Parliament, to officially announce that the main problem in Khamenei’s view was the amount the budget allocated to the National Development Fund (NDF). It turned out that in the original budget bill, the government had asked the parliament to exempt it from depositing 34 percent of the country’s oil revenues into the NDF and instead allow it to use that share of the budget to pay for necessary current expenses and development projects. This exemption would have gone against the law pertaining to the Sixth Development Plan, which explicitly orders the government to allocate 34 percent of the country’s oil income to the fund over the coming year. In recent years, part of this money has been returned to the government coffers, but when that has happened, the payment has been recorded under the heading “financial assets,” not under the “oil revenues” heading. And over the last couple of years, this has been done with the Supreme Leader’s permission. 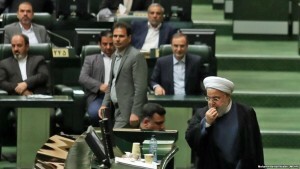 For example, Clause D of the current year’s budget officially allowed the government to spend more than 14 trillion tomans (close to $3.33 billion) of the National Development Fund’s assets on the Islamic Republic of Iran Broadcasting (IRIB), defense, water supply projects, efforts to address dust storms and other projects deemed necessary [Persian link]. Leaving aside the constitution of the Islamic Republic — which allows the Supreme Leader to interfere in anything and everything in Iran — the Leader is not specifically mentioned in any laws connected with the NDF. The fund’s charter does not mention either the Supreme Leader or the need for his permission to allocate its assets. What the charter does clearly state is that “resources of the Fund shall not be used to cover costs, acquisition of capital assets [or to] repay debts of the government in any form.” There is no exception to this legal provision. Nevertheless, in the previous year, Ayatollah Khamenei officially allowed the government to dip into the fund’s assets to pay some expenses. The Speaker of the Parliament did not regard this move as a violation of the law, even though he had to dig deep into the constitution in order to justify his view. 8. Domestic production of pneumococcal vaccines to prevent pneumonia, meningitis and sepsis. It is worth noting that the same law was used to order the government to repay these funds in the coming years — although this is unlikely to happen. In Iran’s forthcoming budget, no money has been allocated to repay the fund. In addition, the government initially planned to completely remove the budget line for the NDF and allocate funds elsewhere. It was only after the intervention of Ayatollah Khamenei that the government was forced to return 14 percent of this money to the fund. The government is fully aware that Iran’s oil revenues will fall sharply and, because of the ensuing recession, it cannot rely on substantial tax revenues either. However, it has to come up with a way to pay for the increase in its expenses. And with the country’s inflation hovering around 25 to 30 percent, it must also do something about the salaries of government employees and pensions for retired people, many of whom are now living close to the poverty line. On the other hand, because of the recession, the government also needs to finance development projects and create jobs. It is impossible to reconcile these competing needs without resorting to financial resources outside the falling tax and oil revenues. Crucially, what is problematic is that the Supreme Court and the government might not agree on what is necessary and what is not. Perhaps in the long run, Ayatollah Khamenei’s stance will be regarded as a positive move, and his decision to ensure the NDF receives its allocated share of the budget shrewd. It’s nothing new for Khamenei to demand special emphasis on investment in certain sectors, fuelled by his own particular take on the economy and the way he believes the country should be run. Looking closely at the budget for 1398, he appears not to have many problems with using the assets of the National Development Fund for purposes he favors, but when it comes to the way that sanctions, recession and inflation are ruining the economy, he expects the government to finance necessary expenses — government employment salaries, development projects and job creation. Where that money will come from is a mystery. How will the NDF Money be Spent? The first article in the bill for the 1398 budget specifies that the ceiling for withdrawing from the NDF’s fund is 40 trillion tomans, over $9.52 billion. Half of this amount, or 20 trillion tomans (close to $4.8 billion), is to be spent “as agreed upon by the Plan and Budget Organization and the General Staff of the Armed Forces.” The other half, declares the article, will be spent as specified in “Table 21”. The bill does not go into details about the first half of the money, but it is worth looking at Table 21 to get an idea of what the Supreme Leader deems to be necessary. The details for each entry can be found on pages 346-360 of the budget bill. However, a glance at the table shows that of the 20 trillion tomans, more than 7.7 trillion tomans (close to $1.85 billion) will go toward paying for the bonds issued in previous years. The executive branch and its multitude of institutions will receive 7.127 trillion tomans (less than $1.6 billion), while military and security institutions get 4.26 trillion tomans on top of the 20 trillion tomans that was already earmarked for them. Third come religious and publicity institutions, with 315 billion tomans. The remaining funds go to education. In recent years the budget for religious and publicity institutions — which primarily play a role in propping up the regime’s ideology — has increasingly been scrutinized by the public. Many people believe paying for these institutions should not be part of the government’s “necessary expenses.” However, the chart below shows that the Supreme Leader does not agree. He considers them to be necessary enough to receive their share from re-allocated National Development Fund money.